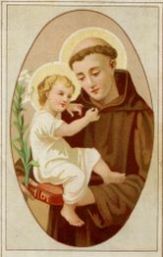 There are many prayers to St. Anthony of Padua (1195-1231), patron of the poor and a Doctor of the Church, asking for his aid, particularly in finding lost articles. St. Anthony was a Franciscan (a member of the religious order founded by St. Francis of Assisi) who was known as a great preacher and theological instructor. His sermons were so inspiring that his fame spread throughout France and Italy in the ten years before his death. Saint Anthony was known the “hammer of heretics” for his devotion to the faith. Pope Gregory IX, who canonized him as a saint in 1232, called him “The Ark of the Covenant." Many prayers to St. Anthony mention specific favors and requests, including aid for travelers and pregnant women! Numerous miracles have been attributed to him. In one of the most famous of these, he was seen one night in a room where he was staying bathed in light with the Child Jesus (the ultimate source of light, indeed!) in his arms. (Versions of this image, such as the one at right, have been depicted in paintings and statues over the centuries.) With typical humility, St. Anthony asked that this vision be kept secret until after his death. Saint Anthony, perfect imitator of Jesus, who received from God the special power of restoring lost things, grant that I may find (mention your petition) which has been lost. At least restore to me peace and tranquility of mind, the loss of which has afflicted me even more than my material loss. To this favor I ask another of you: that I may always remain in possession of the true good that is God. Let me rather lose all things than lose God, my supreme good. Let me never suffer the loss of my greatest treasure, eternal life with God. Amen. Since you were so gracious to poor sinners, do not regard the lack of merit on the part of him who calls upon you, but consider the glory of God, which will by exalted once more through you, by the salvation of my soul and the granting of the petition that I now earnestly present to you. As a pledge of my gratitude, I beg you to accept my promise to live henceforth more faithfully according to the teaching of the Gospel and to be devoted to the service of the poor whom you ever loved and still love so much. Bless this my resolution and obtain for me the grace to be faithful to it till death. Amen. Although St. Anthony’s feast day is June 13th, his aid can be invoked at any time. Let us try to emulate this devoted servant of God in our love of helping others! Three Great Prayer Resources Available in our Web Store!